This year we wanted to own Black Friday. Not an easy task, right?! Anticipating the Black Friday sales, we collaboratively worked with Nobila Casa on an effective strategy that would make waves in the home & deco industry. Nobila Casa is a chain of home & deco stores from Romania. They are selling products both offline and online. Their purpose? To help clients create a home that’s unique to their lifestyle and make the most of special occasions and life every day. According to EUROSTAT, in 2017, 7 out of 10 internet users in the EU shopped online in the last 12 months. The proportion of e-shoppers varied considerably across the EU Member States, ranging from 23% of internet users in Romania to 82% each in Denmark, Germany, Luxembourg and the Netherlands. 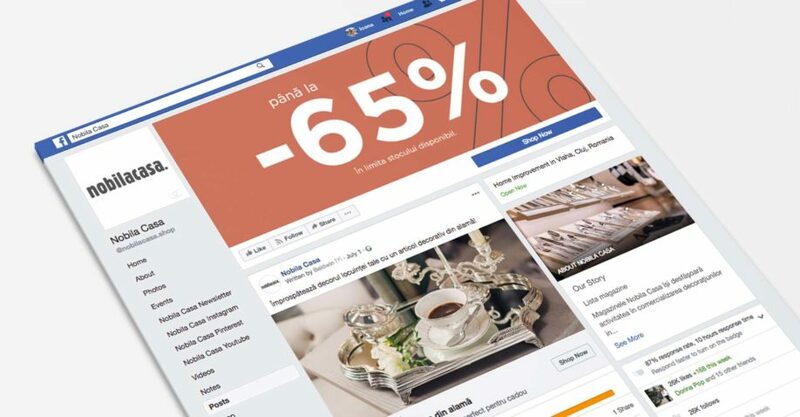 Considering the fact that a high percentage of Romanians are sceptical when it comes to online shopping, our challenge was to increase sales not only offline but also online. And we did it! The context Like any retailer, one of the most important aspects you need to consider is the timeline of the campaign. This year, Nobila Casa’s strategy was to align with the rest of Romanian retailers and start the Black Friday campaign earlier than November 30. That’s why it was important for us to be stubborn about our goals & flexible about our methods. Usually, the sales are dropping a few weeks before Black Friday, but the consumer’s interest is growing. According to Google trends, the searches about Black Friday are starting in the middle of October. Our marketing strategy made use of owned, paid & shared media. Nobila Casa’s internal marketing team did a great job preparing & maintaining the website, blog & social media. We helped them by creating ad campaigns on Google, Facebook & Instagram. On Google AdWords, our strategy was to reach the audiences most susceptible to buy despite the Black Friday sales. So, what we did was to target people interested in certain product categories and land them on smartly filtered Black Friday landing pages. We promoted the sales using site link extensions, callout extensions, and promotion extensions. Our audiences were interested in the products themselves, and the Black Friday offers came as a pleasant surprise. Our secret? Keyword research, optimised landing pages and demographics, strategic bids on devices and locations. And of course, appealing copy. Since we also create and manage various ongoing campaigns for this client, we improved the existing campaigns with new extensions inviting the users to discover our Black Friday campaign. On Facebook & Instagram, our strategy was to reach new and old visitors alike. As we did on Google, we created strategic audiences, prepared the ads and the filtered Black Friday landing pages. A/B testing was our best friend: clicks versus traffic, general ads versus carousel ads versus offer type ads, simple copy versus copy with emojis etc. We also reached our old visitors through our dynamic remarketing campaigns. Since the Black Friday campaign was available on the online and offline shops alike, we choose to promote Nobila Casa’s locations on Waze. This way, we increased the visits of their physical locations. How? Through branded pins and promoted search. Branded pins: they allowed drivers to know that Nobila Casa is on or near their route. The pin showed the location and some important information if the driver clicked on it (including the one about Black Friday sales). Promoted search: Each time someone used promoted search, Nobila Casa showed first in the search results of nearby drivers looking for comparable services. This way, Nobila Casa managed to stand out on crowded routes. We announced the Cyber Monday campaign through social media, email marketing, promotion extensions on Google AdWords & Facebook Ads. We love Facebook offers and of course we used this feature for our Cyber Monday campaign. They are massively under-used and under-appreciated by online marketers. But not by us! What we like about Facebook offers is their impact. They are great in terms of viral reach because Facebook is boosting them in user friends’ newsfeed. Moreover, it asks the users who click it if they want to share it. Emails and reminders are some other extra benefits. Ok, let’s talk about the money! In November, Nobila Casa’s advertising budget increased with just 36.02%. Now that Black Friday is over, we focus on keeping the results for the next months as well. How? Through campaign optimization, budgets and of course, dedication. Are you curious about Baldwin’s mad advertising skills? Check out our website or get in touch!